Challenges are exciting! Food challenges? Well, they’re beyond exciting! Food challenges makes me anxious, in a good kind of way. My thoughts turn to them every waking hour and I’ll be constantly searching for inspiration at every opportunity. And sometimes, the searching and the planning gets the better of me that I’m concocting some massive production in my head and I’m knocked back to reality with a holler from the other room…”MUM! S won’t share!” or “MUM, we need batteries for the Wii remote!” or MUM, there’s a spider in the bathroom!” Yada yada yada yada!” Yeah. Welcome to my world. Where serenity is a luxury, but where chocolates provide harmony amongst the living creatures. As long as everyone shares, that is! But before you all get sucked into a vertigo of domestic chaos and parenting pandemonium, here’s a chocolate marquise dessert that takes control and restraint out of your vocabulary . Word of caution: for serious chocoholics only. This chocolate awesomeness is an indulgent dessert of 14 eggs and a whopping 1.6lbs (750g) of dark and bitter chocolate wickedness. 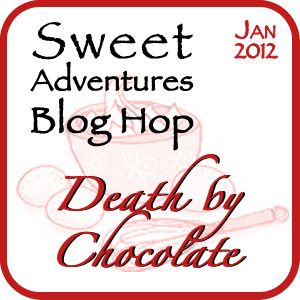 Totally synchronised with this month's Sweet Adventures Blog Hop theme - Death by Chocolate! 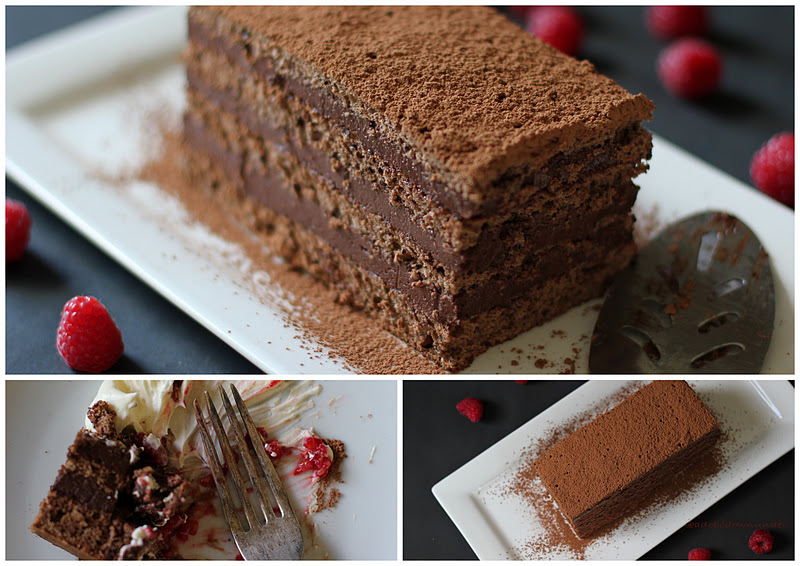 Chocolate marquise is simply chocolate mousse, layered with some chocolate sponge cake and chilled before serving! Served with a dollop of whipped cream and fresh raspberries! Indulgence to the extreme! The recipe is adapted from The Golden Book of Chocolate published by McRae Books. There were some kinks in the recipe, but negligible at this point. But may be worthwhile to point out to the publishers at a later time. In the meantime, let's enjoy this truly "death-by-chocolate" dessert attempt. This recipe has 2 parts: sponge cake and mousse. Takes a bit of time, but the rewards are worth it! Preheat oven to 180*C. Grease a 30x40cm jelly roll pan or cookie sheet with sides and line with baking paper. Whisk the flour and cocoa in a medium sized bowl. In a large bowl with a hand-held beater or a whisk by hand, beat the eggs and egg yolk until creamy. Set aside. Using a stand mixer, beat the egg whites and sugar until soft peaks form. Fold in the egg whites into the egg yolk mixture. Add in the flour and cocoa mixture in 2 batches, gently folding and stirring after each addition. Spread the mixture into the prepared pan and smooth the top with a spatula. Bake in the oven until springy to the touch, about 10 minutes. Using a stand mixer or in a large bowl with a hand-held beater, beat the egg yolks and sugar until pale and creamy. In a medium sauce pan, bring the milk to a boil. Pour half the milk into the egg mixture and continue beating. Pour the custard mixture back into the pan and return to medium to low heat. Using a heat proof spatula, stir continuously until it coats the back of a metal spoon. (While stirring make sure the heat is on low-medium and not too hot that it'll immediately cook the eggs. Then you'll get an egg-smelling custard and scrambled eggs in there. To avoid this, lift the pan from the heat every so often while stirring and putting it back on the heat). The custard coats the back of a metal spoon and stays on without dripping when you run your finger through. Place the chopped chocolates in a large glass bowl, then pour the hot custard on top. Stir until the chocolate has melted and the mixture is smooth. Cover and refrigerate until cool. Gently fold in the whipped cream, set aside until ready to use. Line a 23x12cm loaf pan with baking paper. Place one strip of the sponge cake in the pan. Cover with 1cm layer of mousse. Cover with a layer of sponge and gently press down. First there was mousse. and then there was cake. Repeat until all the mousse and sponge are in the pan. Snug as a bug in a rug. Chocolate mousse showing off! To serve, turn onto a plate and dust with cocoa. To slice the marquise cake, run your knife through hot water and wipe dry with a kitchen towel then slice. Warm the knife with every slice. Serve with a dollop of whipped cream and some fresh raspberries! There's a bonus here too! Since we've cut off the sides and ate bits and pieces of the cake, we had extra chocolate mousse to indulge in! Oh yeah! Did I mention this month's theme is death by chocolate? chocolate mousse with fresh raspberries! Sweet. Indulgent. Chocolate. Mousse. Heaven. Thank you to the hostesses behind the Sweet Adventures Blog Hop: 84th and 3rd, Dining with a Stud, the capers of the kitchen crusader, Delicieux and this month's host The Hungry Australian! This is a blog hop! So why don't you skip on down to all these gorgeous chocolate deliciousness and be inspired to make, bake and eat your way into chocolate heaven! Oh my goodness, you had me at 16 lbs of chocolate! So dangerously over the top! @tutti-dolci.com Thanks for hopping by. Its 1.6lbs. I think the font style makes the *dot* too small. Agree though that it is bordering the chocolate danger zone. Ha! What a lot of chocolate... your chocolate marquise looks absolutely delicious and then the mousse... sure is "Death by Chocolate"! It is quite rich with so much chocolate! Thanks for dropping by! Absolutely! I'm bringing it to work to share with colleagues! I think they're in for a rich dessert after lunch! Wow!! Your chocolate marquise looks fabulous. It makes me feel guilty just looking at it! I think I better wait until our chickens start laying eggs before this one goes on the must do list! Thanks Kyrstie! Absolutely a lot of eggs and chocolate in there! Lordy! Now that is one indulgence! Well done... very nicely executed. Love your blog too... oh, and you are following me on Twitter... I sent a follow back request to you and haven't heard? Am I in? Thank you Michelle! You're too kind! I'm really enjoying the blog hops! Your chocolate marquise looks amazing!!!! I love the layers and that you serve it with raspberries too. Chocolate and raspberries go so well together. Thank you so much for joining us in this blog hop event! Thanks Jennifer! It was a bit of an effort but worth the chocolate adventure! Your recipe looks so amazing. I love it. Thanks Jennifer! That's really sweet. Really appreciate it! Thanks Jo! And enjoy the blog hop! Your citrus love pineapple love tarts look just as lovely! Cheers! Thanks @ Food Wine Sleep! My office colleagues had a dessert treat this morning with these! I'm still learning to use the DLSR and getting hooked on props and photography! So really appreciate the compliment. How beautiful is this dessert! Love the layers, it sounds divine! 14 eggs? 750 grams of chocolate! Man, that is a serious cake you've got there! You've done a beautiful job with this one - I can't get over how great it looks and how well you've styled it. Bravo! And yummo, too!